3d printing giant 3d Systems is getting a little bigger. They announced today they will buy Geomagic, Inc. Geomagic provides high quality tools for converting 3d scans to printable content. Their Geomagic Studio is the top product for reverse engineering and scan-to-3d print workflows. This acquisition adds to other companies it has bought in the scan-to-3d print space in the past year. In 2012, 3d Systems also bought Rapidform, specializing in digitizing scans, and hypr3d, a competitor to 123d catch. 3d Systems clearly is hoping to be able to provide a full vertical workflow for solids. At this point they have the technology to go from scan to print. One thing they seem to be lacking in the toolchain seems to be a high-end consumer scanner. Z-Corp produced 3d scanners before 3d Systems acquired them, but the product line seems to have been abandoned. 3d Systems acquired Vidar systems, giving them medical and dental grade imaging technology, but nothing in the prosumer range. Perhaps we’ll see an acquisition of CreaForm, NextEngine, or even Faro within the next year? It depends which end of the market they’re more interesting in serving. 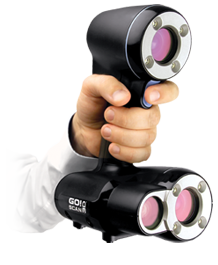 Consumer grade would imply CreaForm, but industrial users tend to use the pricier and higher quality Faro scanners. What does this mean for innovation in the 3d printing space? 3d Systems now has an even larger patent portfolio to defend. They recently brought a patent infringement suit against Kickstarter and Formlabs for the Form 1 printer. Will they attempt to use their patents to limit growth in the 3d scanning sector as well? The counterargument is that this aquisition shows new 3d companies there are large buyers for 3d innovation. Perhaps this purchase will nudge potential founders to try their new 3d printing idea.